← Not Your Typical Log Cabin Quilt. Linda and I eliminated another UFO today. Well actually two. The day was a gorgeous day. I could not hardly wait for her to get here. Last night I took a child quilt and tested to see how Lizzie was working. Worked very well thank you. 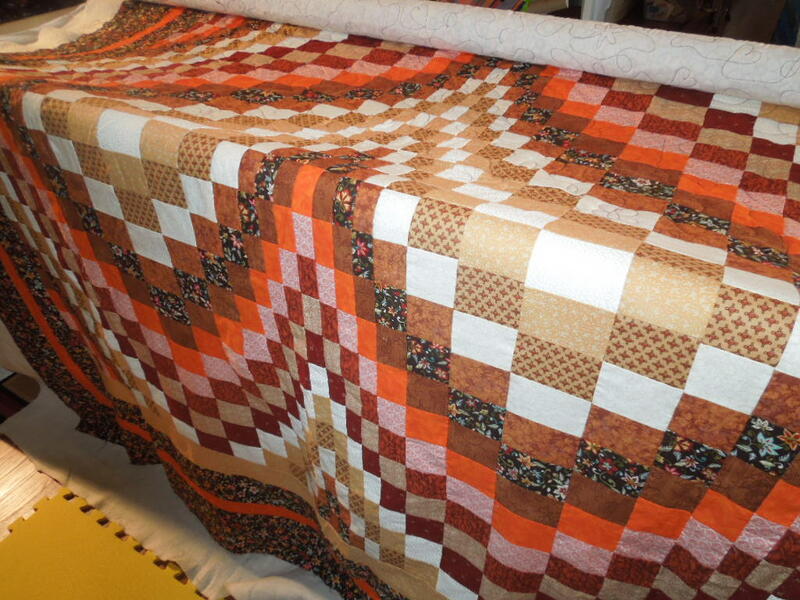 This morning I cleaned up the machine, oiled everything, loaded her quilt for today on the machine. Agent Wade got here and after looking at a few patterns and talking about what was going on during the week she started to quilt. LIZZIE STARTED ACTING UP LIKE A CRAZY WOMAN. I started working with the top and bottom tension and after a while she was back on track. We threatened to send her to the dump with the rats. That straightened her up. Every few minutes I went in with my mirror and looked under the quilt. It was equivalent to a cheating spouse. It was going to take a while before we could trust Lizzie again. She did not let us down. I used the mirror to look under the quilt to see how the bottom tensions were doing. They started looking pretty go so I gave her some slack and only looked at her every ten minutes or so. Well if you have noticed the posts here mostly have been about Linda’s work. I had a UFO that I was trying to get finished so I could put it on the frames. I did. I finished today. 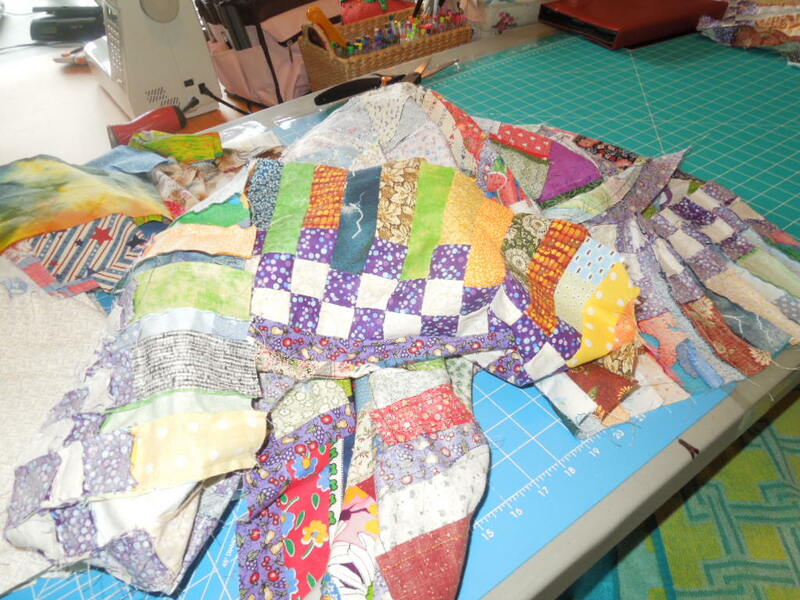 Tomorrow I will clean Lizzie up again and start on quilting. Well right during the middle of the quilt Linda wanted to quilt a bee. She tried on a place that would not show if it did not work out and she did not like it so I drew on with erasable ink and she went over it with the machine. Just as I finished drawing it she said “Oh I needed it upside down.” I wondered why.. Well to make a long story short DING BAT here loaded the quilt with the bottom at the top and the top at the bottom. 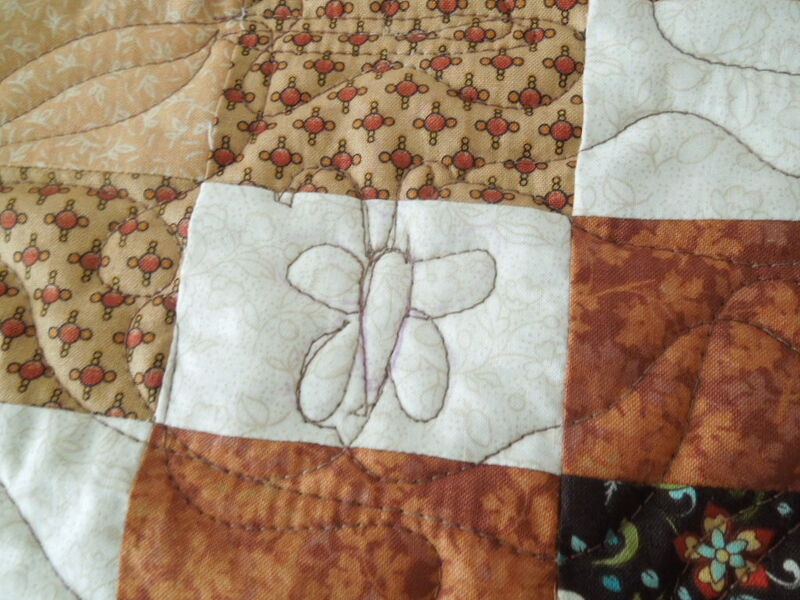 She did not want to tell me so she took the challenge and quilted the quilt backwards. Did very well if you ask me. Now granted it would have only taken about five minutes to pull out the pins reverse the order in which it was but she just decided to take the challenge. VERY GOOD JOB. I will be paying attention next time. Here is my project you will be seeing in a few days. Lets just say those 1000’s of tiny pieces I sewn together just about got the best of me. Linda’s project loaded UPSIDE DOWN. 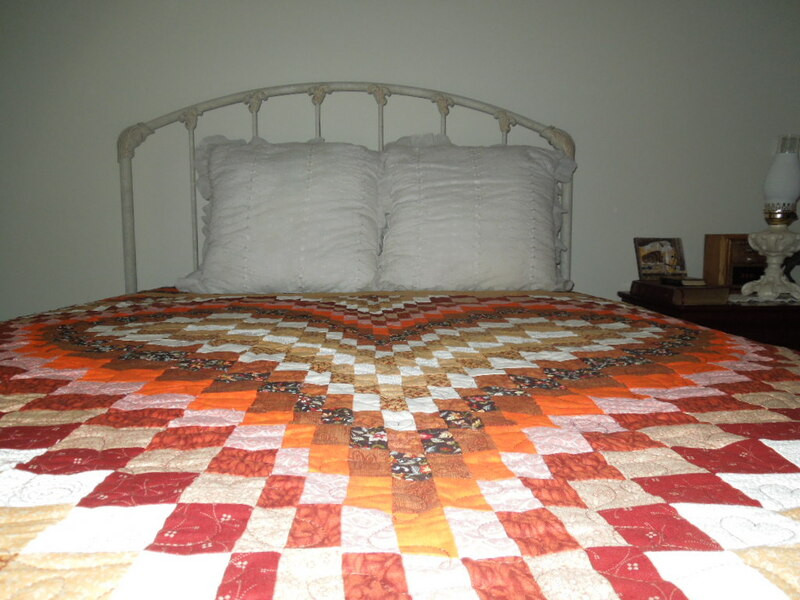 It was a Bargello heart and she started quilting at the bottom point instead of the top. Oh well it worked out. We float our tops. I like that much better than having to load that bottom pole. You can work out errors if needed when you float or so we have found out. Up close of her designs. She had to quilt all these designs upside down. It would have been hard right side up but extra hard this way. It looks good on the bed we use for the photo shoots. You have to admit. Pretty dang good. Now I can not wait until next Sunday. This entry was posted in 2015 New Posts, Tin Lizzie. Bookmark the permalink. 3 Responses to Well Another One Bites The Dust! That is GORGEOUS!!! You 2 are REALLY doing WELL> I LOVE everyone. Missed seeing Ms Wade the last 2 wks. Maybe next Sunday. Well after having the Lizzie for about 7 years terrified of it and now conquered that fear.. 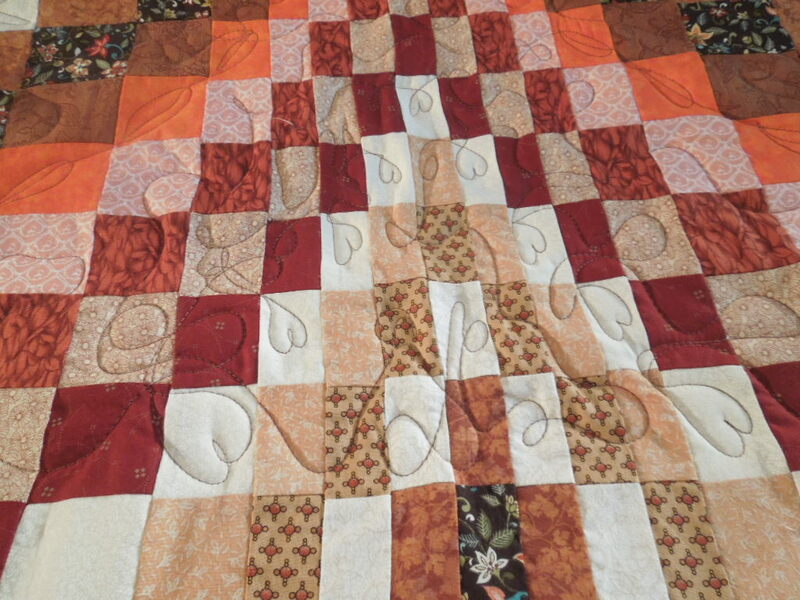 I feel pretty good about what is going now with the quilting. to seeing you soon. 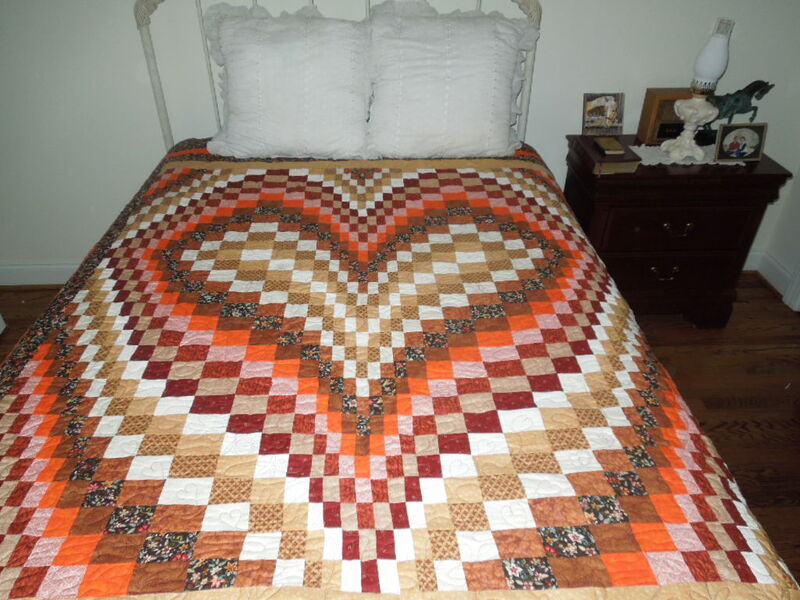 You will LOVE Chris’s quilt. She has hung in there and FINISHED IT FINALLY.